Bankseal - sigilli di sicurezza in plastica sono elementi di tenuta di sicurezza che hanno sia corpo e sistema di tenuta in plastica. Essi sono adatti come soluzione di tenuta di sicurezza in qualsiasi campo di attività o qualsiasi necessità di controllo dell'integrità di tenuta. Per grandi ordini, si prega di inviare una richiesta. Clicca qui. Material: Polypropylene; Metal locking system. Variable length plastic seals (Пластмасови пломби за сигурност, Plastične brtve, Πλαστικές σφραγίδες, Műanyag plomba, Sigillo di sicurezza, Kunststoffplomben mit variabler Länge) that provides a solution for an adjustable closing according to the need for security purpose sealing. The scope is very wide, namely sealing solutions of fire extinguishers, the tanks with various fluids, bags, trucks, concrete mixers trucks and generally any necessity of security sealing and access control. Variable length plastic seals can fit many applications from securing the neck of a bag or mail sack to sealing chemical drums, first aid kits and fire extinguishers. 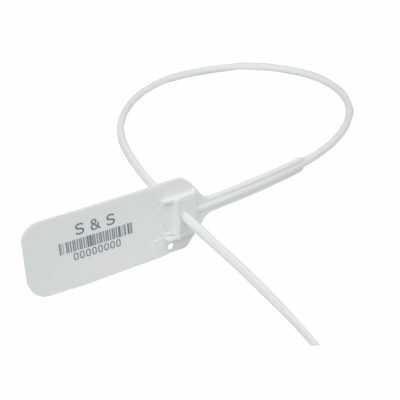 They have an adjustable length much like a cable seal but offer a much higher security level and an audit trail due to sequential numbering and the ability on some seals to be bar-coded and have a company name and logo printed or laser etched on. The variable lenght plastic seal gives users the opportunity to provide access control to objects such as warehouses, vehicles, containers, gas stations, offices, vault cash in banks, cash collection bags, slot machines, lockers, luggage and many other objects. Also food (fish, meat, honey) and fur animals can be protected from forgery. The design of the pull-tight seal is configured of plastic in the form of arrows. They have a surface for marking an individual number and latching mechanism on the one hand, and a plastic cable on the other. Like a zip tie, the cable forms a loop during mill threading into the collet, which can not be separated without damaging the cable or the locking mechanism. I sigilli standard hanno un numero unico di identificazione e sono consegnati direttamente dal nostro magazzino. I sigilli personalizzati hanno un numero di identificazione personalizzato e possono avere il logo stampato o inciso a laser. Ci metteremo in contatto con voi entro 24 ore.
Che cosa si vuole sigillare?